PHOTO: BRADEN AND SHYLAH HART. When Braden and Shylah Hart heard that statement in their grade 9 Issues in Canadian Geography class, it didn’t sit right with them. “It didn’t make me feel very well to hear my teacher putting down farmers,” says Shylah. 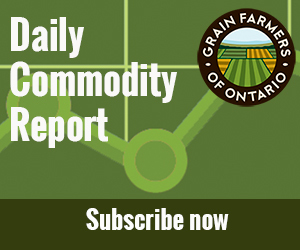 The Harts, students at Napanee District Secondary School, help their parents with the family business — Hart Acre Grains — which operates an elevator and a cash crop farm growing corn, soybeans, wheat, and canola. So after school, they went to their dad. “It’s very dangerous if the educators are teaching opinion instead of fact,” says Herb Hart. He helped the twins look up some information online about bee health that was taken to school the next day. When Braden and Shylah presented this additional information to their teacher, it began a debate about credible scientific sources and the difference between opinions and facts. “As good geographers we put the inquiry model into action, asking questions and gathering various viewpoints on the issue, and then drawing conclusions,” says Daryl Sheffield, the Hart’s geography teacher, via email. Not happy with the way their defense of farming was received by their teacher, Braden and Shylah went home for the weekend with an assignment to provide more sources and facts within an essay that would support their view of the relationship between bee health and grain farming practices. On behalf of his children, Herb reached out to Grain Farmers of Ontario for help with the project, and through the member relations department the Harts were connected with Hugh Simpson, beekeeper proprietor of Osprey Bluffs Honey Company. Simpson uses his broad following on Twitter to share a balanced view on beekeeping and the challenges faced by beekeepers. He feels it’s important for everyone from students to government policy makers to understand the multiple factors affecting bee health. Simpson also referenced some of his recent tweets which highlighted current research and scientific arguments that point to numerous factors, such as loss of habitat and diverse forage, affecting bee health. In their essay, the Harts wrote about Varroa mites, viruses, and poor nutrition. Whether your children attend an urban or rural school, discussions about agriculture don’t frequently occur in classrooms. AgScape (formerly Ontario Agri-Food Education) has created resources for teachers that make it easier to incorporate agriculture and food information in their lessons. Parker acknowledges misinformation may be shared in the classroom about agriculture, but says there are great tools, such as the Consumer Trust Model from the Centre for Food Integrity, that can guide parents in responding to situations like the Harts experienced. This experience was an important lesson in agvocacy for the Harts. “I learned there is a lot more information you need to look at than just the first website that comes up on the internet. There is a lot more people and facts you have to look at to understand an issue,” says Shylah. “The most important thing is don’t listen to everything everyone says before you look at the scientific facts,” says Braden. It’s a lesson Simpson hopes more people will learn. Herb says he is proud of the way his children handled writing the essay on their own. AgScape (formerly Ontario Agri-Food Education) has a variety of resources which are ready for teachers to use in the classrooms. These are available for free download at www.oafe.org. The resources include lesson plans, info-graphics and electronic games for grades 1-12. AgScape also has a Teacher Ambassador Program, where grade 7-12 teachers can request free lessons on a variety of agriculture and food topics, delivered by a certified Ontario teacher. There are also two websites which are very valuable resources for educators (and parents too). Agriculture in the Classroom Canada has a website called All About Food which provides information on a variety of topics from farm to fork. The website is accessed at allaboutfood.aitc.ca and there is also a print version which can be ordered for classroom use. GrowingCareers.ca is a resource which highlights careers in agriculture and food. It has over 75 video profiles of agri-food professionals talking about their jobs, plus other useful tips about career pathways.